The deminer robot loses its battle with the terrain after a mere 10 minutes – but for Lahiru Jayatilaka those ten minutes represent both an important achievement and a crucial lesson. 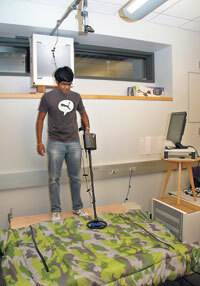 That a machine designed and tested in the lab survived that long in the field was heartening, but it was clear to Lahiru that it would take a great deal of money and time before the machine could provide a viable substitute for a human being holding a metal detector. He decided to devote his energy toward finding simple, cheaper methods of enhancing the performance of deminers instead. In the process he found not only his calling, but received one of the highest distinctions that Harvard University can bestow upon its undergraduates – The 2010 Hoopes Prize. The winners of the Hoopes Prize (there are 89 this year) are selected by a panel of 80 professors. It is awarded for an exceptional undergraduate thesis, and includes a monetary reward. The glory that comes with the Hoopes only confirms Lahiru’s status as a golden boy. Excelling academically, he had won an Edexcel International World Subject Award for accounting by his 17th birthday. A student of Stafford International School, he was a nationally ranked tennis player and swam for the school team. He was Head Prefect (both in the junior and senior sections) and active in his Interact club. He also played the guitar. And finally, without even really trying (his mother submitted that application for him) he got into Harvard. 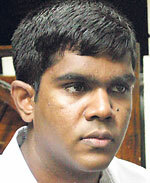 Now 22, Lahiru is a graduate and anticipating his year as a researcher at his famous alma mater. He’s clear about what he wants to achieve – a functioning PETALS prototype. PETALS which stands for Pattern Enhancement Tool for Assisting Landmine Sensing, is a collaborative effort amongst researchers from Harvard’s School of Engineering and Applied Sciences, MIT and Carnegie Mellon University. Their goal is to create affordable portable visual interfaces that can help deminers with metal detectors. Lahiru’s involvement with the project began with a chance encounter with Thrishantha Nanayakkara. The latter had already made headlines for his demining research utilizing robots – one featured a device loosely strapped to a mongoose – and he now offered Lahiru the chance to work on a real world problem. After months of planning, Lahiru joined Thrishantha and fellow student Matthew Valente on a test mine field in Embilipitiya. Though the robot did survive for 10 minutes, Lahiru knew he wanted to look elsewhere for a solution. “It sort of showed us that robotics has a long way to come. These soldiers need something that is reliable, that you can send out remotely and that you can call back. When it sinks into the mud, it defeats the purpose.” Now totally hooked, Lahiru went back to studying the literature on demining. For decades, an expert with a metal detector was the most effective solution – but it was far from efficient. “I thought that perhaps we needed to change our approach and think of simpler technologies, things that could help people immediately,” says Lahiru. Faced with near constant danger coupled with the monotony of long hours, deminers must struggle to stay focused. The beeping of a metal detector creates a kind of sonic alarm bell, allowing the deminer to locate possible mines. Still, detectors cannot distinguish between lethal mines and metal waste. “When you take a battlefield, so many bombs have been dropped, so many shots have been fired – there’s just so much metallic debris,” says Lahiru. “More often than not it’s harmless – it’s a coke can or a bullet shell – but you have to act like it’s a mine. You have to go down on your knees and probe with a handheld tool.” Such ‘clutter’ can really slow down progress – and in a field where resources and manpower are scarce, it’s a significant problem. It’s the reason there’s such a discrepancy between the cost of laying a mine (low) and removing a mine (high). Lahiru’s research began with a simple observation: “Deminers who had more experience working in the field were better than those who had just started off. That meant these experts had acquired some skills that made them experts.” Lahiru’s research into how such experts approached their task revealed that the latter actually built ‘spatial patterns’ in their heads. Such spatial patterns were the visualisation of the metallic field generated by a piece of metal. The point where a detector stopped beeping would help an operator identify an ‘edge point’ and by identifying several ‘edge points’ he could know the approximate shape of the buried object. “If you take a landmine, the metallic field is normally semi-circular and if you can visualise the metallic field then you have more of an idea,” says Lahiru. “These experts, when they come across debris, don’t just listen to the sound, they try to ascertain what they shape of the field is.” Unfortunately, holding the pattern of edge points in your head isn’t an easy undertaking. “I tried to do my own experiment and I realised how difficult it is,” says Lahiru. But in the end, it came down to memory. “I could train 10 de-miners in the importance of identifying spatial pattern, but at the end if your memory is better than mine, it puts me at a disadvantage.” For his thesis, Lahiru took 44 undergraduates and trained them in the art of recognizing spatial patterns. He then provided them with a small screen, attached to the metal detector that would show them the pattern the detector was picking up. It wasn’t a foregone conclusion that the screen would work – previous research had speculated that such a screen might only serve to distract a deminer, and would be akin to placing a T.V beside a driver. Lahiru published his results in his thesis – visualizing patterns: decision support for human based demining – and they were promising. Users who had to remember the outlines detected targets with a probability of 77%, while those with visualisation support had 95% accuracy. While using the screen, users were also 33% more likely to accurately pinpoint the location of a mine. But when it came to rejecting clutter, his subjects were a lot more conservative. Even when it didn’t fit the pattern of a mine, they were reluctant to dismiss the threat. The last finding is a reflection on how difficult it is to make such decisions. For Lahiru, understanding the psychology of a deminer is as important as getting the mechanics right. His research has also given him insight into how mines can cripple entire communities. “Most people know landmines as things that explode when you step on them…but it’s not just lives but livelihoods that are lost because of the presence of landmines.” People are barred from work and play, and even from necessities like food and water because of the threat of mines. His deep empathy for communities under siege is one of the reasons why Lahiru is pushing for a usable prototype that’s cheap and efficient. As with his two last summers, he hopes to visit another demining camp before heading back to Harvard. He believes data from actual teams working on the problem is what he needs. It’s one of the reasons why, once the product comes out, he’s heading right back home. “One of the first places I’d like to test it is here,” he says, looking forward. Published in The Sunday Times, Sri Lanka on July 4, 2010. Words by Smriti Daniel. 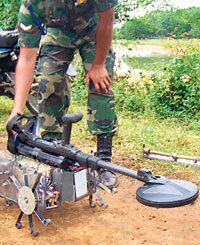 Tags: Demining, Harvard University, Lahiru Jayatilaka, Landmine, Metal detector. Bookmark the permalink.